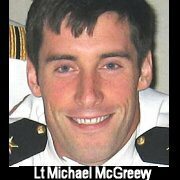 of Portville, NY, who was killed in Afghanistan June 28 2005. Tommy rocked the pull up WOD yesterday! Post loads and body weight to comments. Joey 300 lb OHS .. that is right!! 300#! what now! Add your points and post them to comments. "Fight Gone Bad!" In this workout you move from each of five stations after a minute.The clock does not reset or stop between exercises. This is a five-minute round from which a one-minute break is allowed before repeating. On call of "rotate", the athletes must move to next station immediately for best score. One point is given for each rep, except on the rower where each calorie is one point. Add your points and post them to comments. Use 95 pounds, 65 pounds or broomstick as needed and post time and load to comments. Steel Skeleton Bell Island, Richmond..
Jessica and Rob KBS.. ohh yea there is a REAL 400m mark now..should we use it? Has anyone seen this guy?? Click here for the Halloween WOD video!!!!!!!!!!!!!!!!!!!! Also.. notice that I posted all of the Halloween pics to a folder located on the bottom left side..